Interest rates seem to have been at rock bottom forever. It's been ten years of hell for savers - and heaven for borrowers. The so-called "smart money" says it's a racing certainty that interest rates will be raised above 0.5% for the first time in a decade on Thursday. The financial markets give it a 90% chance of happening. But at first glance it seems a strange time to make borrowing more expensive. The UK economy has been weak this year, the world's three largest economic powers (US, China and the European Union) are trading blows with damaging tariffs, and the uncertainty of Brexit is affecting the confidence of business to invest. Why would you want to take money out of the economy now by making an average tracker mortgage of £150,000 cost £20 a month more? 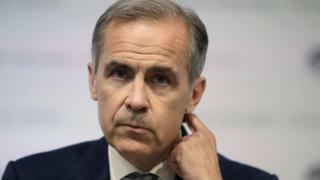 Mark Carney, the Governor of the Bank of England, is expected to say that the UK economy has hit its "speed limit". The economy isn't growing very fast - so what does he mean? With unemployment at 4.2% - a 43-year-low - any more economic growth would lead to increased competition for the existing workforce. That would lead to employers having to offer ever higher wages - and wage inflation is something the Bank is particularly keen to keep under control. Higher wages increases demand for goods and services, which pushes their prices higher. The Bank's number one job is to keep annual increases in the cost of living at or near 2% - a target set by the government. It remains above that target at 2.4%. For the first time in 30 years we are spending more than we are earning - that means we are only keeping up our lifestyles by borrowing more or raiding our savings. That is something that clearly can't go on forever. By raising interest rates the Bank of England is also encouraging us to save a bit more and borrow a bit less.